A great success for Team Cermak! Last weekend, they achieved the 1st place in the overall ranking at the races in Hänchen DE and 2nd place in Mohelnice CZ. Overall, all participating MEGA riders were very successful and satisfied. We will be in Castelnau - France next weekend. 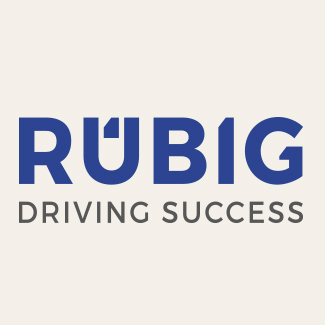 Direct race updates from the track can be found on our new Facebook page at https://www.facebook.com/rubigmega. 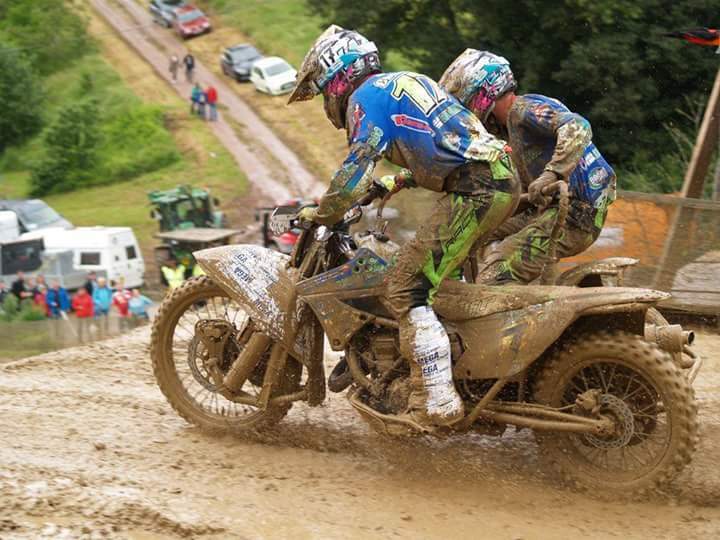 Lot of rain and lots of mud were the hallmark of the last race at the Czech Republic's International Championship. 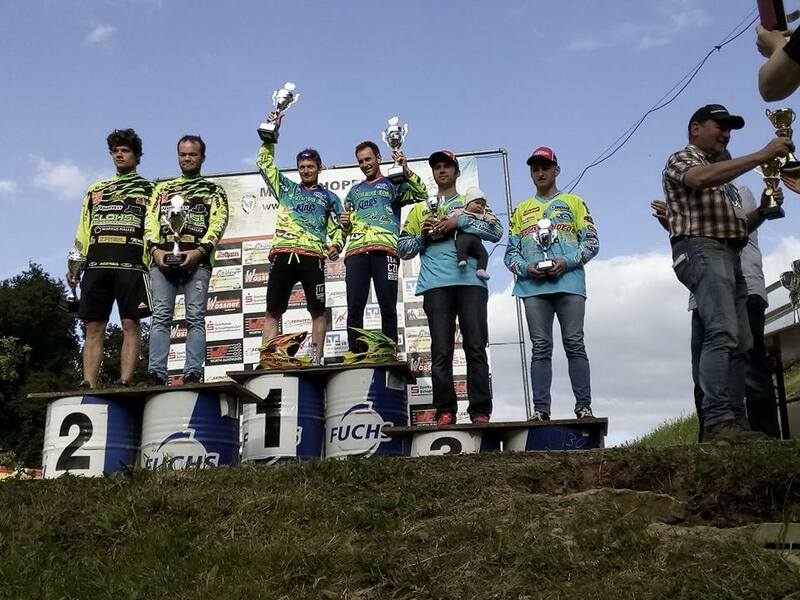 Team Cermak won both final rounds in the home race in Kramolín, and thus completed the overall victory in the home championship. In the 2017 season this means the sixteenth time the total victory in series. This weekend Team Cermak took part in the last international race. Unfortunately it was not possible to defend the last year's bronze, as some mistakes, including a boggy start, were taking place. They finally finished the first race on 6th place and the second race on 5th place which means the 5th rank in the overall evaluation. 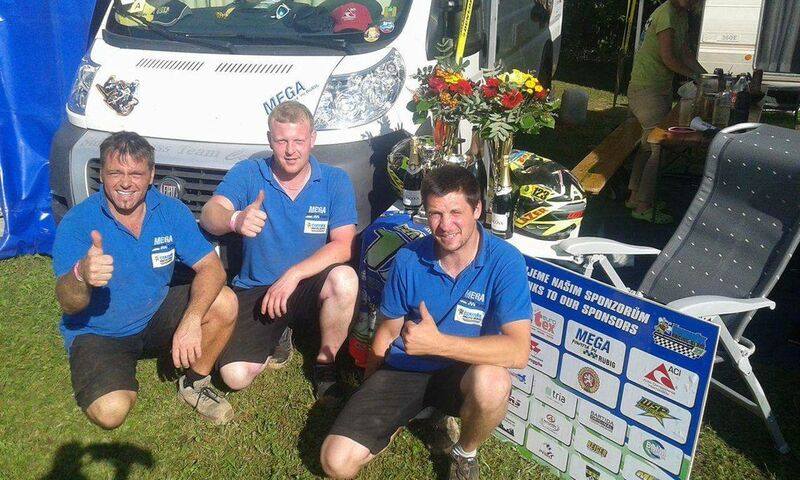 Many thanks from Team Cermak to their team colleagues Černý Vitoň and Team Vejchoda for the great teamwork. After very good results both in the free and in the time training in the morning, was the start to the first run not quite according to the expectations of Eddie Janecke and Gordon Bothur on their WSP / MEGA from MSC Letzlingen. 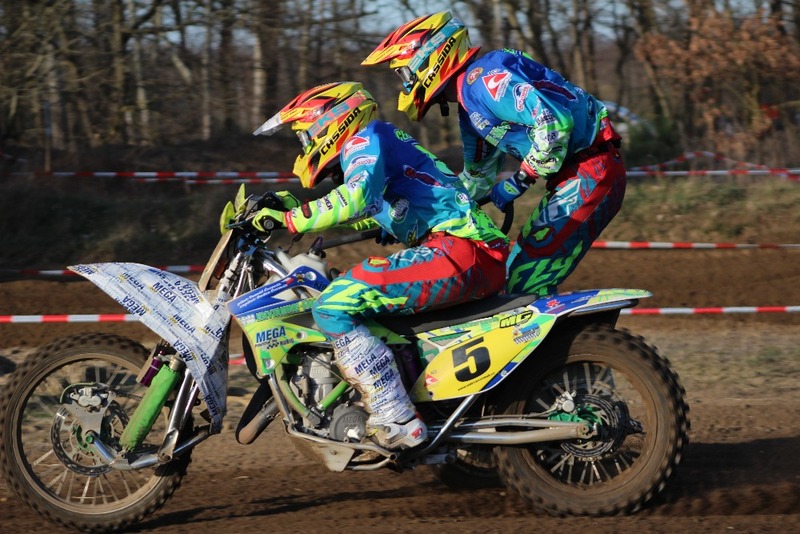 They came third from the first corner behind Hildebrandt / Luther (Altmersleben) and the leading duo Pitzer / Nicolaus. On a very well prepared but very fast and spiked with short corners race track in the German Erzgebirge, it was a fight for the top which was not to be surpassed in tension. The crossers with number 23 had a free ride forward and did not restore the lead on this sticky track to the finish. After analyzing the first race in the break, the team changed the chassis setting and thus the strategy for the start of the second race was according to the taste of Janecke/Bothur. They completed their rounds in a clean manner over 20 minutes +2 laps before Pitzer/Nicolaus with a distance of 17 seconds, and again collected the full points for the further expansion of the tables. The guest team Anton Wanger with co-driver Marcus Richter from Austria, also with a strong Rübig-MEGA engine on the road, mixed after a nagged start the entire field of pursuit from behind to fourth place. Thus contributed to a grandiose event for all participants and spectators. The next weekend team Janecke/Bothur goes to Westeregeln to the penultimate run of the team-crossers with the goal to get the full score. 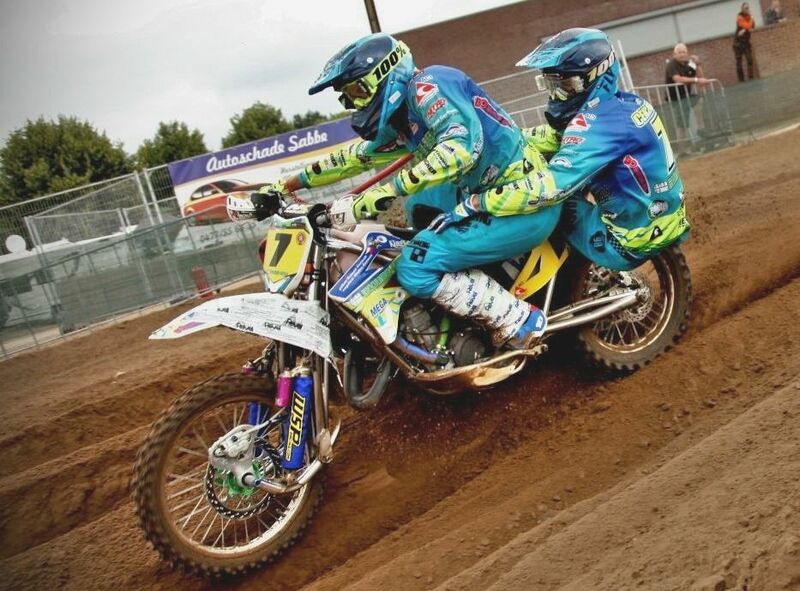 The MEGA sidecross cross-team Eddie Janecke and Gordon Bothur managed a more confident success in the team on Sunday at the LVMX championship run in Letzlingen. 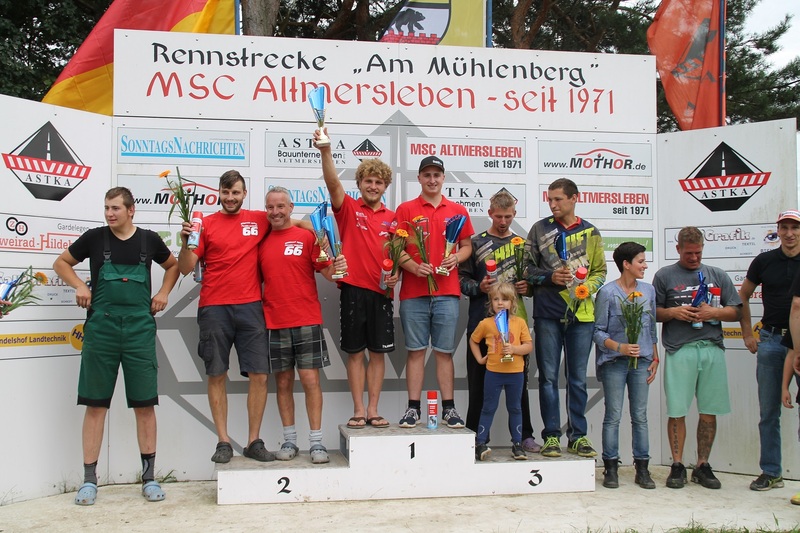 After a restrained start in the first race, they were able to take the lead in front of the team Pietzer / Nicolaus on their WSP / MEGA in the first third of the race and drive safely through the knee-deep sand of the Letzlinger track. After a decent rainfall between the races, Petrus once again had a heart for sidecar crossers and closed punctual to launch its locks. In the second race the team Janecke / Bothur made short process in corner three and shot themselves on place one, which they did not give up until the end of the race due to constant fast racing on a rather heavy road. With the 50 points earned Team Janecke / Bothur was able to further expand their overall lead in the championship. Pietzer / Nicolaus in front of Koch / Schödel took second place. 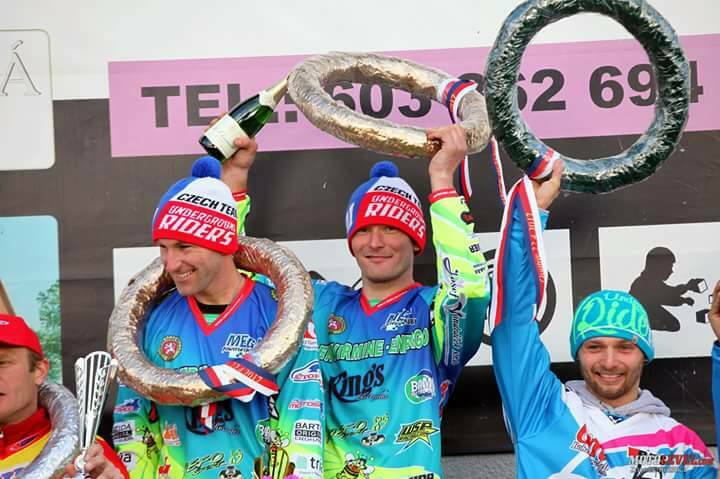 The next weekend they will start in the Erzgebirge. Many thanks to the event team of the MSC Letzlingen for Ralf Janecke for a successful event with a super prepared race track! The World Championship season is at the end. 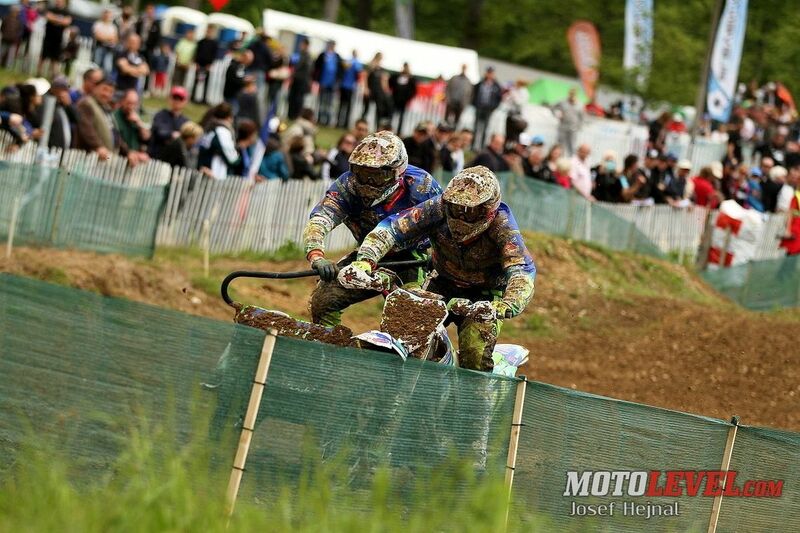 On the weekend was the penultimate race in Rudersberg, Germany. The route is very difficult with few possibilities for overtaking. Furthermore the bad weather with rain contributed to the fact that the route became even more difficult. In the qualifying Team Cermak managed to finish fifth after the start. In both races they finally made it to rank 5. The final race will take place in Dutch Markelo and Team Cermak hopes to finish 4th overall in the World Championship. 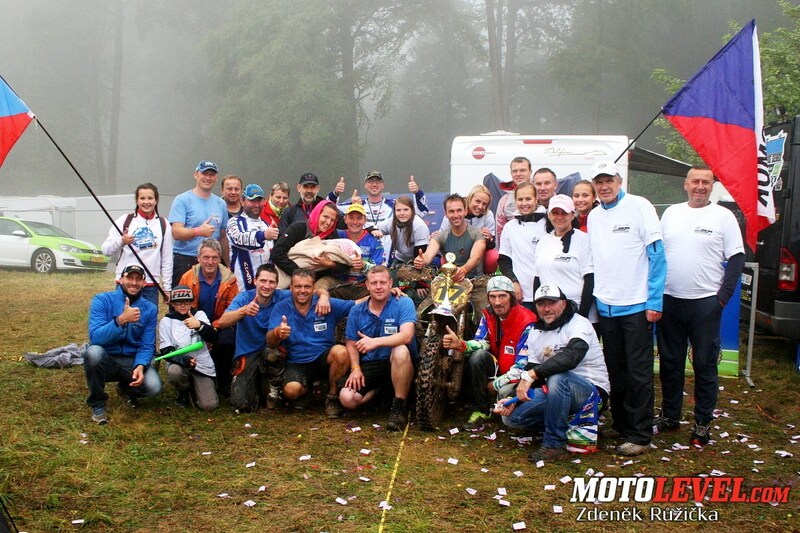 The last race of the Czech Championship took place on Sunday 3rd September in Kramolin. Team Cermak managed to confirm the lead and secure the title of the Czech Champion 2017. "A big thank from Team Cermak to all the fans for the great atmosphere, you were great". The last race in the summer months was on the heavy track in Roggenburg, Switzerland. In this race Team Cermak tried to get as many points as possible in the World Championship series and the qualification with the 2nd place in Group B secured the 4th place at the start in the Sunday race. 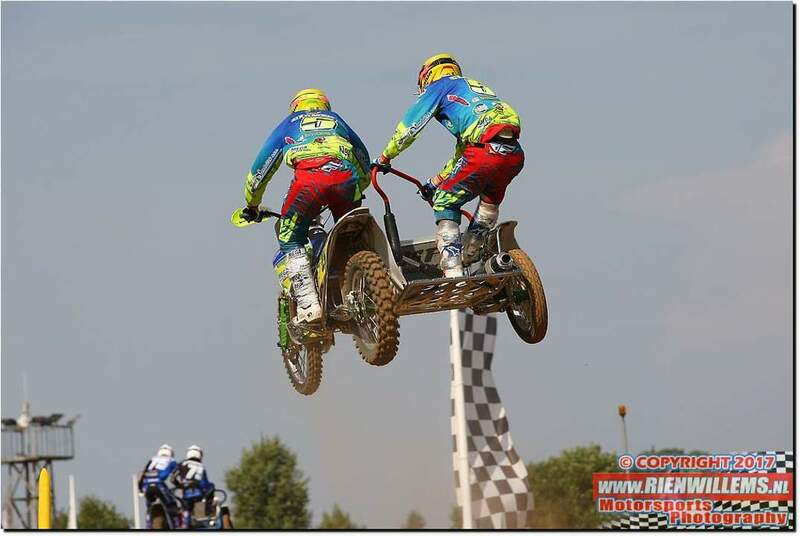 In the first race Team Cermak fighted with Team Giraud - Mucenieks, came off the track and lost some positions. In the second race the start wasn't well and they finally came from the 9th place to the 4th place in the finish and finished fourth in the final classification. Team Cermak now has the second year of the World Cup and every new experience in this championship race is a valuable experience. In the last two races of the World Cup, Team Cermak expects an exciting fight for the 4th overall place in 2017 - first in Rudersberg / Germany on the 10th and in Markelo / Netherlands on 17th September. 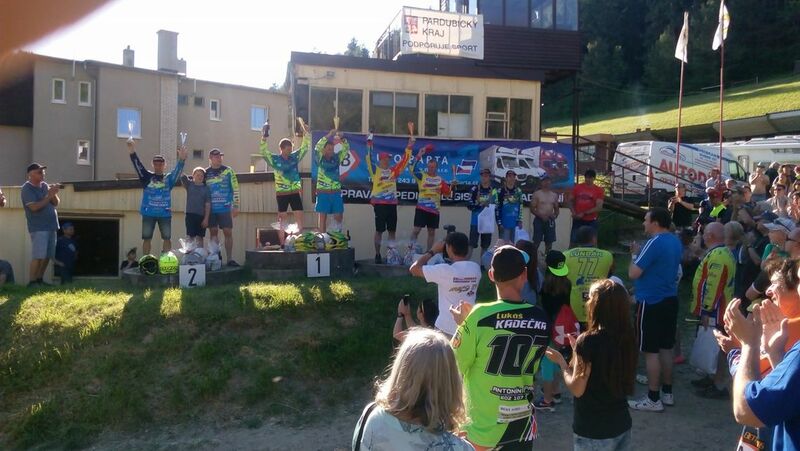 At the 10th World Championship race this season in Stelpe on 12/13th of August the temperature climbed in the afternoon to 35 degrees in the shade. Team Cermak took fourth place in qualifying, which ensured a great start for the race on Sunday. In both races the team benefited from the good start, which meant a place in the top 5 in the first race and third place in the second race. All in all, they took a great 3rd place and now they rank 6th in the entire Championship. This 11th World Championship race in Estonia was not as successful as last weekend in Stelpe. It was only the 6th place in the first and the 8th place in the second race. But there are still 3 other races in this series where Team Cermak will fight for a place in the top 5 in the World Championship. After a furious start, the two side-car crosses Eddie Janecke with passenger Gordon Bothur from the MSC Letzlingen won on a very heavy, but from the organizer of perfectly prepared race track the total victory. Second was Robert Pietzer with the prime mover Micha Nicolaus. The third place went to the team Koch / Schödel. A big thank you to the organizer of this year again a great organized event for all participants. This weekend Team Cermak drove the 9th race of the World Championship in the Austrian Möggers. During Saturday's practice, the fastest lap time was set. The start to the first race succeeded perfectly, Team Cermak was in 5th place and could keep it to the finish. In the second race they were on fifth place after the start and could finish on fourth. This means that the final result is 4th place in this World Championship race. 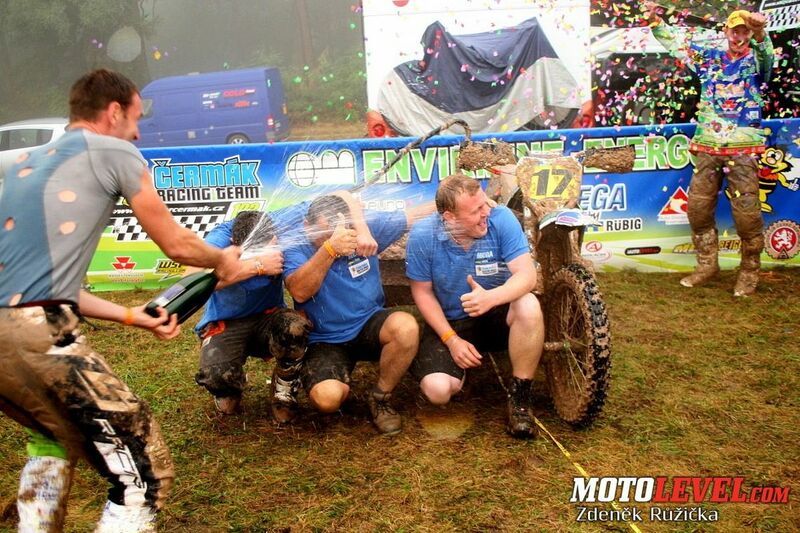 Team Cermak will be preparing for the next races in Latvia and Estonia to join succfessfully the World Championship. The eighth World Cup run was very much in line with the expectations of Team Cermak. In Saturday's qualifying, they finished 4th in group B, a good position for the start of the race on Sunday. In the first race the team was in 7th position, waiting for a mistake by the crews in front of them. After 20 minutes they were in 5th place which they could hold to the end. Team Cermak, for example, started the second race and was already in 4th place in the first corner. In the early stages of the race the team finished third. But the crew Giraud-Musset, who is in the 2nd World Cup position, overtook. Thus, place 4 in this second run would be a success. 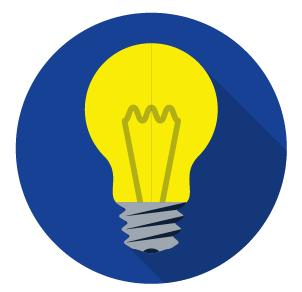 However, due to a technical problem by Giraud-Musset, Team Cermak got back to third place and finished the second round. Unfortunately this weekend team Cermak lacked the experience with the new MEGA engine on sand tracks. The race weekend ended unhappy after the very successful run in France last week. After an unsuccessful qualifying Team Cermak finished 8th in Group B and they only reached the disappointing 17th place in the first race. In the second race they were even able to advance from position 17 to position 14, but they had to finish the race prematurely due to a technical defect (probably disturbance of the electrics). 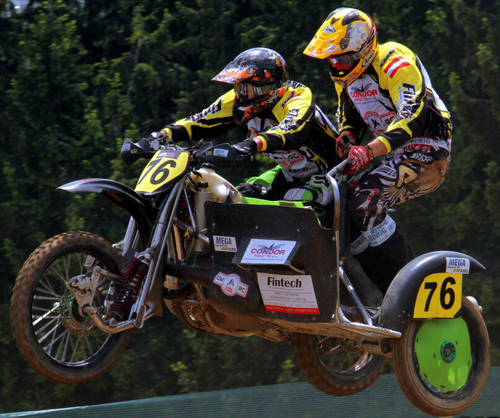 But Team Cermak will again attack fully at the next World Championship race in the German Strassbessenbach. This weekend was according to the ideas of Team Cermak. In time training the motorcycle was adapted and thus the second place in the qualifying could be entered. In the first race the team overtook the biggest part of the field after a bad start and ended up finishing 5th. The start in the second race was much better and they were at the start on 5th place and after an exciting race took place 6, which was finally 5th place in this World Championship race. 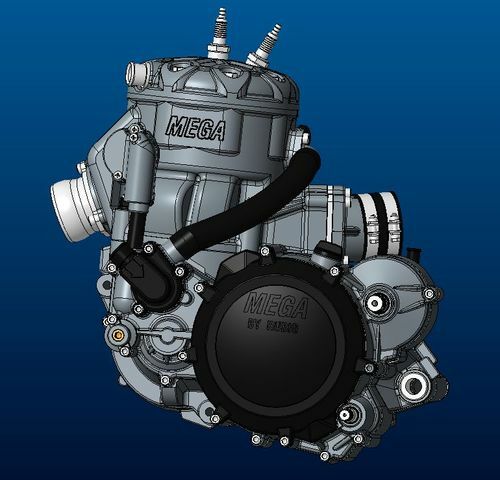 A great success and Team Cermak is convinced to be competitive with the new MEGA engine in the World Cup. The next race will take place in Belgium on the 9th of July. 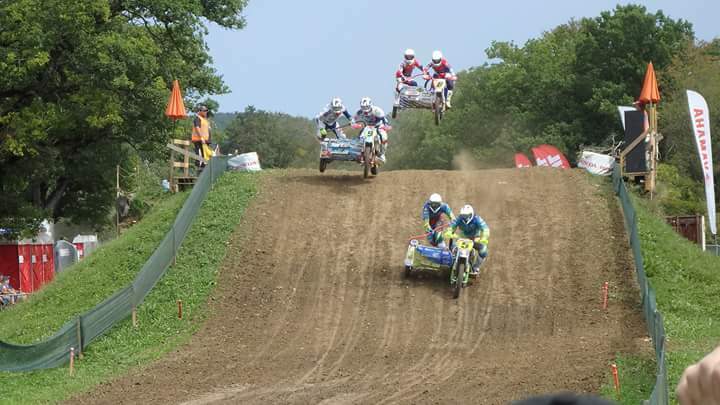 The next MMČR race took place in Jinín near Strakonice, where the course was modeled like motocross races. Team Cermak was in fourth position after the start and finally made 1st place. In the race in the afternoon some changes were made to the settings and as in the first race Team Cermak won. These two races in Jinín were of great benefit to the team in terms of testing new techniques and team Cermak is already taking place for the next race with his MEGA engine at the World Championship which takes place in Iffendic, France. This race was visited by numerous Czech fans and offered interesting supporting programs. Team Cermak used this race to test new technology and prepare for the next World Championship race on the 2nd of July in the French Iffendic. 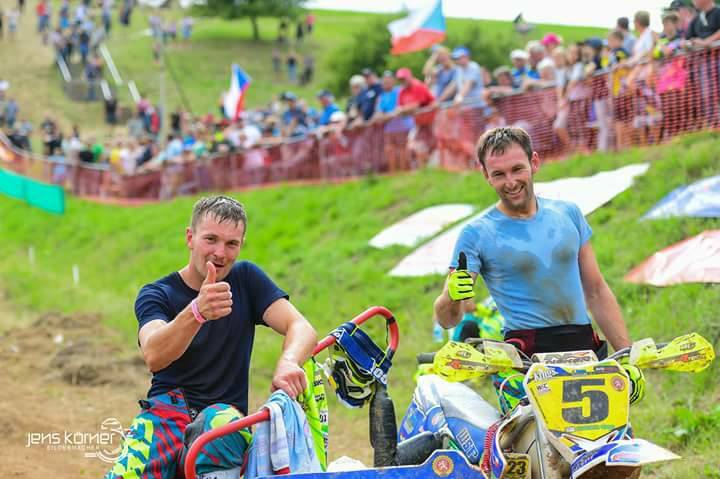 They managed to keep their competitors - the Janouškový brothers - in check and finished both races in front of them. The overall result for Team Cermak was the second place. The next race will take place on Saturday 24th of June in Jinin. Another GP race took place in the Latvian Kegums, which unfortunately did not develop according to the ideas of team Cermak. 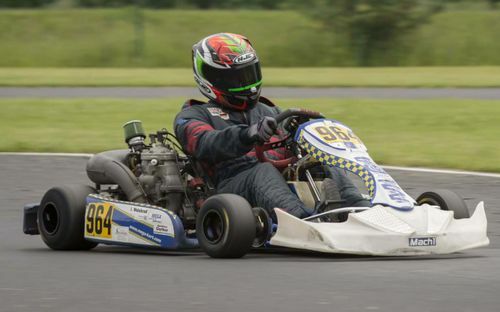 On Saturday the prequalification was still very good and they drove the second fastest time. In the qualifying they unfortunately had bad luck because of a technical problem, which however could be repaired. In the first race they finished 11th place and second race on 9th place in total 10th place. Overall Team Cermak is now ranked 7th after 5 GP races. On June 18th a home race will take place in Czech Stribro and Team Cermak is hoping for many Czech fans. Team Cermak took part in the 4th race of the World Championship in Chaumont, France. The qualifying took place on Saturday with nice, dry weather and the team finished on the 2nd place which was a top starting position for the race on Sunday. Unfortunately the weather changed it started to rain and so the route was very muddy and wet. Team Cermak finished on 15th place in the first race and in the second race on the 5th place. Overall, they finished 8th in the World Championship after four races. Another nationwide race for Team Cermak that offered the opportunity to compete to win the race on this selective circuit with many downhill runs and exits. In the qualifying session they finished 8th despite a defective rear wheel brake and Team Cermak finally won both races and expanded the leading position in the Czech Championship. 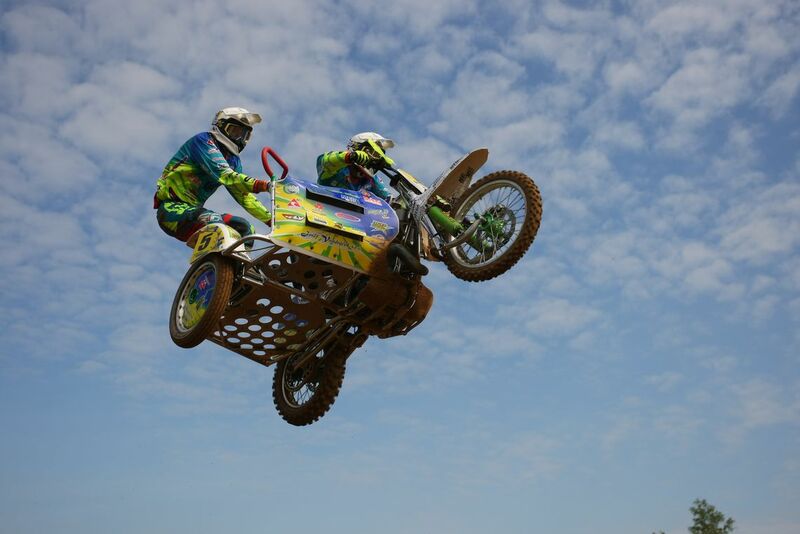 Next weekend they will compete in the 4th race of the World Championship in French Chaumont. 20/21. Of May the fifth race of the German Championship took place in Schopfheim. 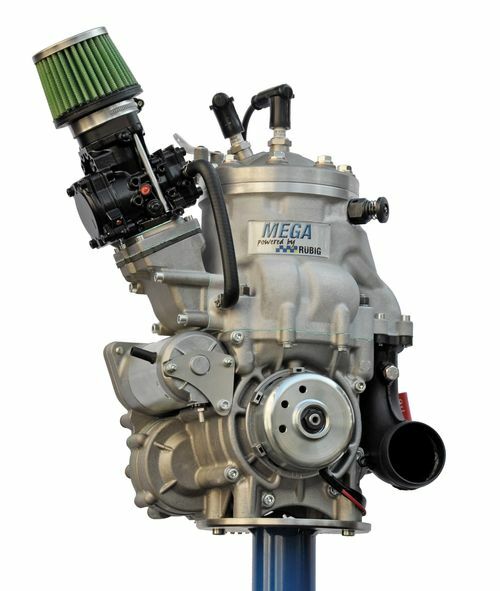 Team Cermak was able to test extensively the newly designed MEGA sidecar engine from RÜBIG in the days before the race and won in both races. They clearly dictated the speed in both races. The next race will take place during the coming weekend in the Czech town Svitavou, where the team would like to show its top form. 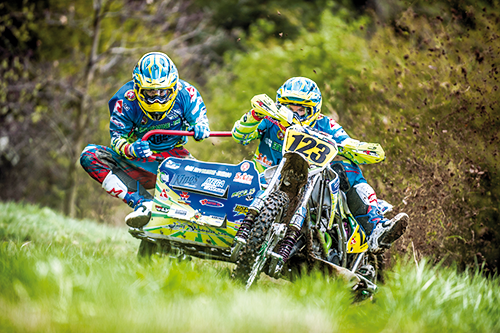 The third race of the World Championship took place for Team Cermak at home in Czech Kramolin near Nepomuku.Mnozí. A team of 52 teams promised thrilling duels in both qualifying rounds on Saturday and the race on Sunday. For team Cermak the home race unfortunately did not develop as expected. Due to technical problems in the qualifying unfortunately only 16th place. This would not be easy for the race on Sunday to come under the first five. But the surprise came - Team Cermak finished fifth in the first race thanks to the great support of the local fans, which is not easy on the difficult track in Kramolin to compete with the world's best. In the second race Cermak started on 15th position and finished on 9th place in the race. 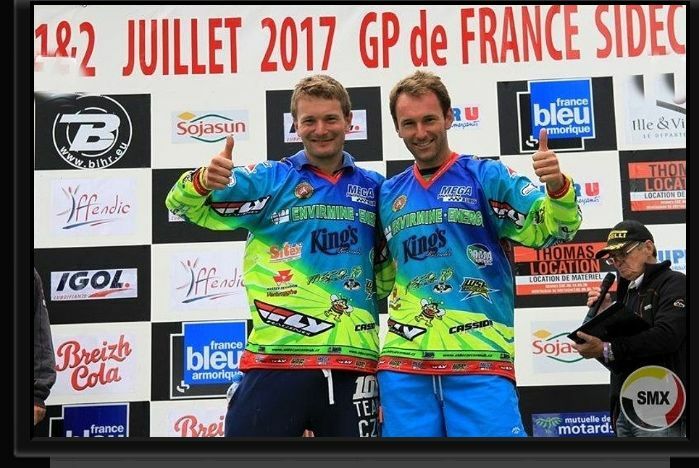 After three races they are on 7th place in the World Championship ranking before the fourth round in Chaumont / France at the beginning of June. After the miserable second run at the first World Championship race in Oldebroeck / NL, team Cermak came fully motivated to the Ukraine with the aim to improve the overall result in the World Championship. On Saturday there was only one qualifying due to the low number of drivers. 23 teams were at the start and Team Cermak finished 8th. In a collision with the Belgian team, Andy suffered a back injury, which he had had to sew at the local hospital. Fortunately the injury was not so strong so team Cermak could start on Sunday. In the first race they finished on 4th and in the second race they finished on 6th position. 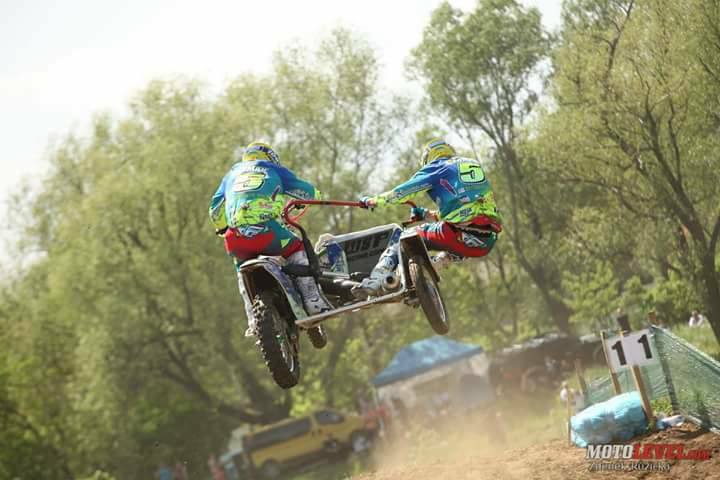 Overall they are on 5th place in the World Championship standings and next weekend (24 May) will be a home race in the Czech Kramolin. In Chernivtski a second team with a MEGA SW engine was participating – Bret Wilkinson and Daniel Chamberlain from Great Britain. They finished on 9th and 5th place and are ranked 5th overall in the World Championship. 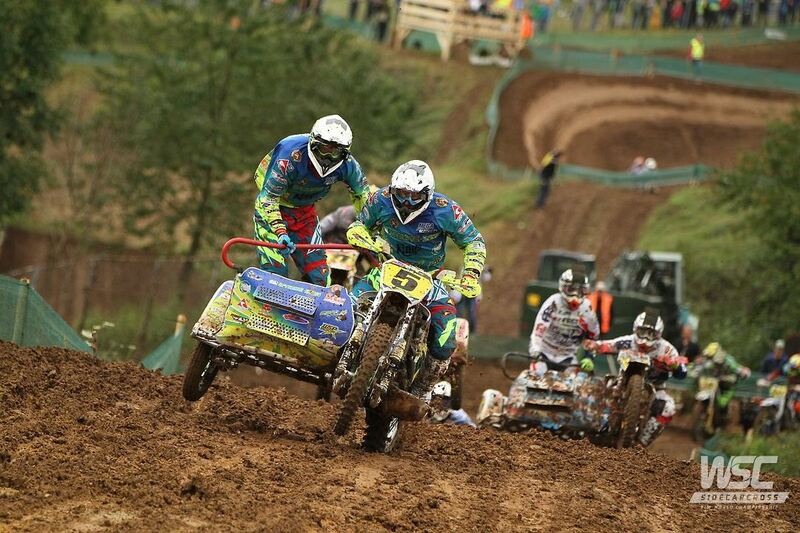 The second race of the Czech Championship took place in bad weather conditions. Even in the morning it was raining so the training, the qualy and the first race had to be driven at mud. Only during the second race the sun finally came out. After the sandstorm last week in Holland, there were once again extreme driving conditions, this time in the form of mud. In both races Team Cermak scored the full score which confirmed the current good form. This race was the second event of the Czech Championship for Team Cermak and was preparing for the next race of the World Championship on 6./7. May in Ukraine. 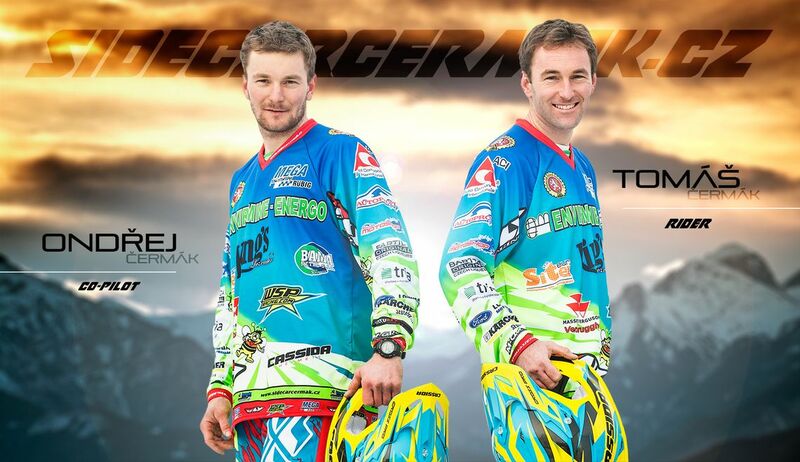 For all Czech fans: Team Cermak will start 13./14. May at the World Championship on the home track in Kramolin. 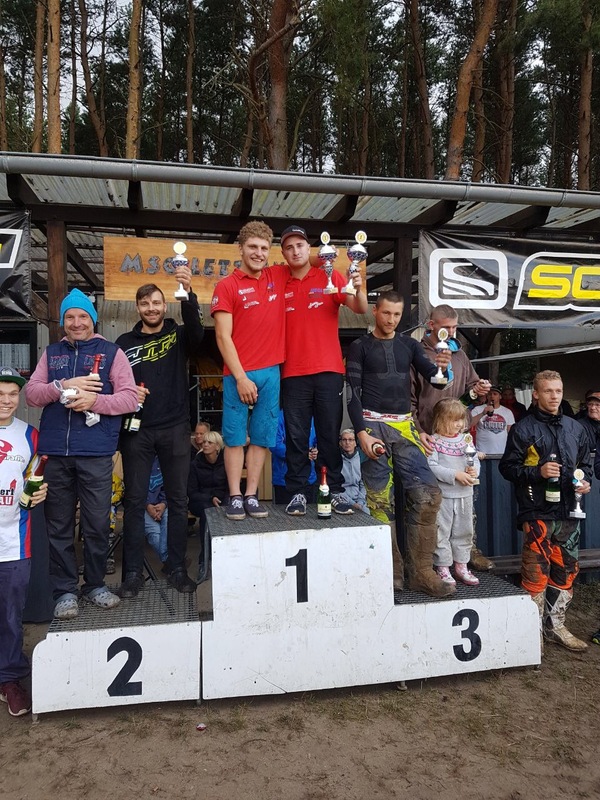 The first race of the season of the Czech championship took place in the morning at bad weather conditions, the sun came out in the afternoon. The organizers were also able to welcome international teams from the World Cup: he Lithuanian crew Daiders-Stupelis and the Finnish Crew Kunnas-Kunnas. Daiders is vice-world champion and 4 years ago regularly in the top three of the World Championship. Organizers are always glad when top teams participate in their championship and thus increase the attractiveness of the races. The victory of Team Cermak in both races confirms the current top form. Also helpful for the team was that it was familiar with the track in Mohelnice from races in previous years. The next week will be the start of the World Cup in the Dutch Oldebroek and team Cermak will try to reach as many points as possible on the track with heavy sand. 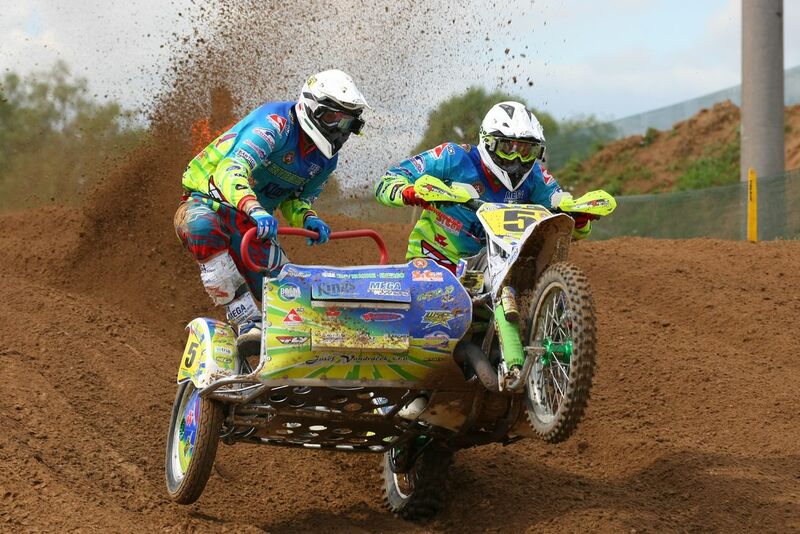 The second race of this year's sidecar season took place again on German ground. Team Cermak knows this circuit well and went very positively in this race weekend. Due to the large number of participants (34), the qualifying was divided into two groups. Team Cermak started in Group B and finished with the second fastest time in qualifying. 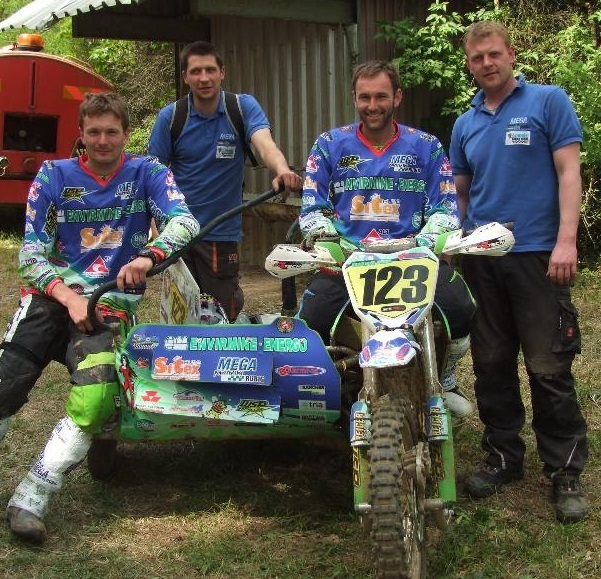 The fastest team were Dutch Daniel / Willemsen / Robbie Bax who would be the toughest rivals in the race. Team Cermak finished on fifth place in the first race after a very dusty start. In the second race they only reached 2nd place due to a technical defect - the shock absorber was broken. This is racing. This season of the German Championship started in Hänchen. Fortunately 34 teams started - to the delight of the organizers and spectators. The first run had to be interrupted and repeated due to route problems. Team Cermak went on the track for all 3 starts (1st and 2nd run as well as repeat 1st run). At the re-start of the first race Team Cermak entered the race from position 3 and in the meantime fell back to fifth place, but at the end with the 3rd place a nice success. Team Cermak also took the 3rd place in the second round of the race and then they managed to overhoule one competitor and went second over the finish line. Overall the 2nd place was a great success for Team Cermak as the preparation phase of this season was a bit hectic. 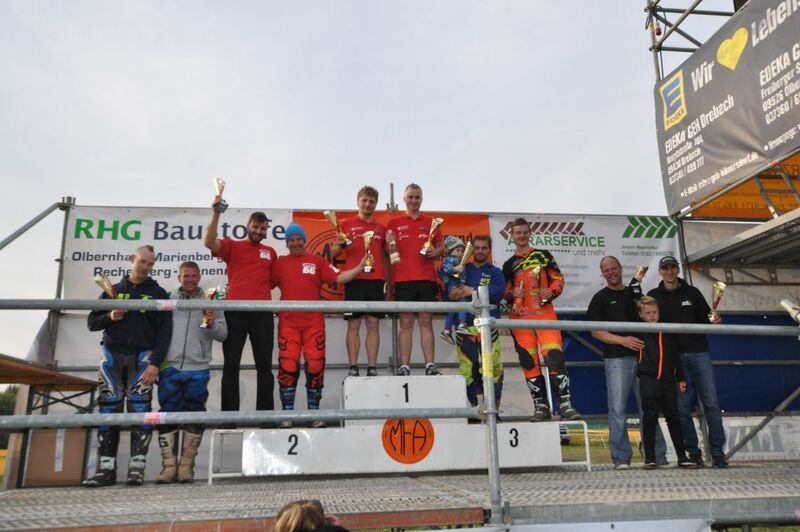 The second race of the German Championship takes place on Sunday, April 2nd, in Schnaitheim. The entire race report in Czech can be found here. On Sunday 26th of March the sidecar season 2017 starts with the first race in the German Championship in Hänchen. 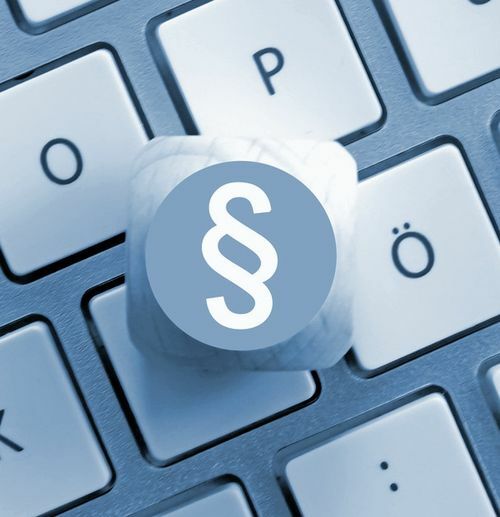 All other dates of the German, Czech Championship and the World Championship can be found here. 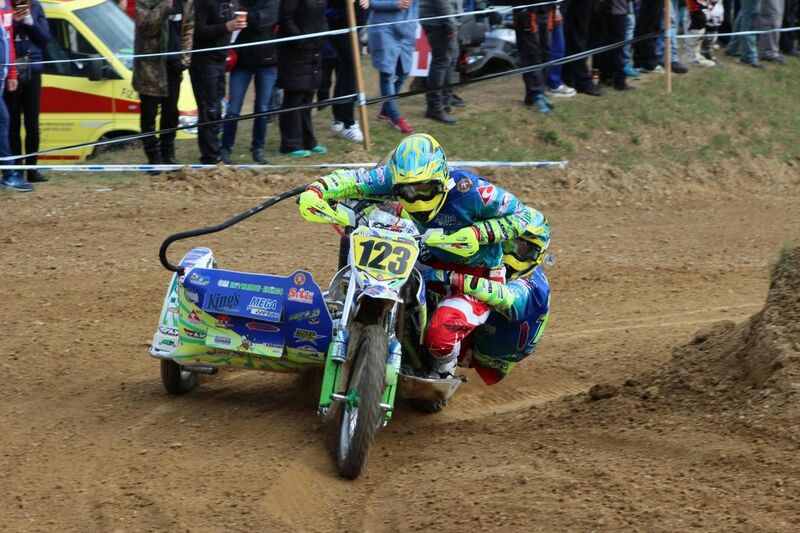 The Sidecar World Championship met last weekend in Rudersberg, where the team Cermak finished second overall in the daily standings and thus the best result of the season ensured. The full report can be found here and the galerie here. The MEGA engine was indeed driven regularly in national and international racing series since the 2012 season, but could never make his potential evidence. The season started with a strong performance of the team Čermák, which could be adjusted in the course of the race even better on the engine and increase its performance. There has been a progress through an engine with exhaust control (PV) which meant that the team Cermak went twice in the third position to the podium. Finally in Rudersberg continued this upward trend and they finished second. 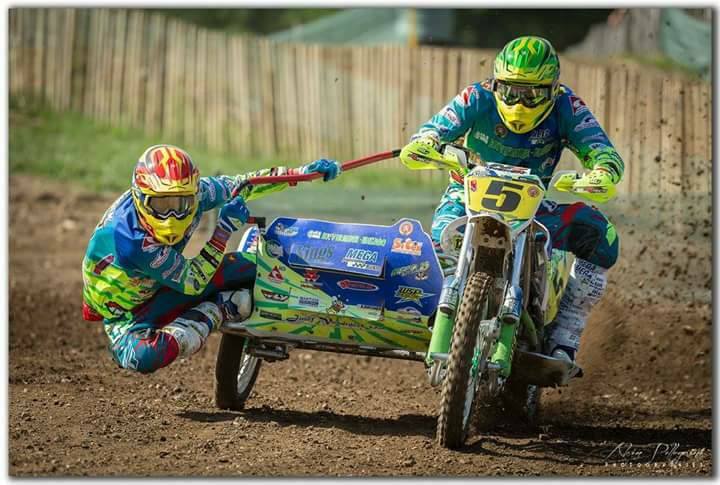 After the excellent results, an experienced team with top mechanics and a steadfast MEGA engine was a 5th place in the sidecar World Championship. Here you can find the pictures. Here you can find the pictures. At the race 30.-31. August 2016 it was the first time that team Cermak was in Stelpe with a MEGA-engine on the podium. They started in this race with the same score in the championship as team Bax. 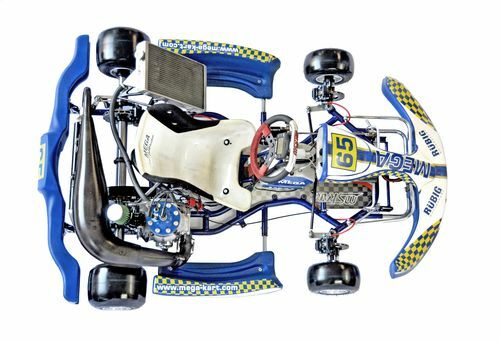 In the first race the team had a good start but in the first corner they swiped with Team Willemsen and they lost 6 places. From 11th place out they managed to finish on the 8th place. In the second race the start was again very good and no problems in the first round. They followed on rank 2 Team Adrienssen / Daiders who were in the lead and also the best team in this year's GP season. For team Cermak it was not easy to hold position 2 and to concentrate fully for 35 minutes. But they managed to finish the second race on position 2 which means in the end the 3rd place overall in this GP race. They stood the first time on the podium this season. Team Cermak is currently on the 4th position in the GP championship. 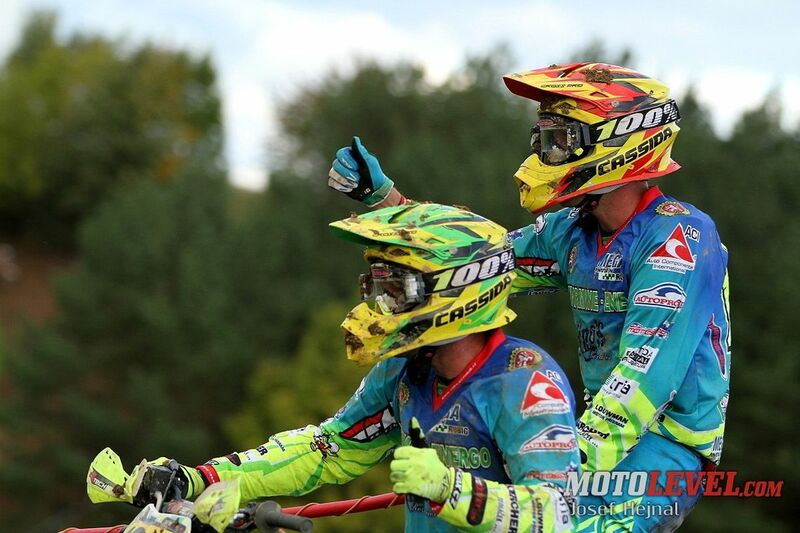 They hope to continue the good results and their great objective is ending the GP championship on place 3. 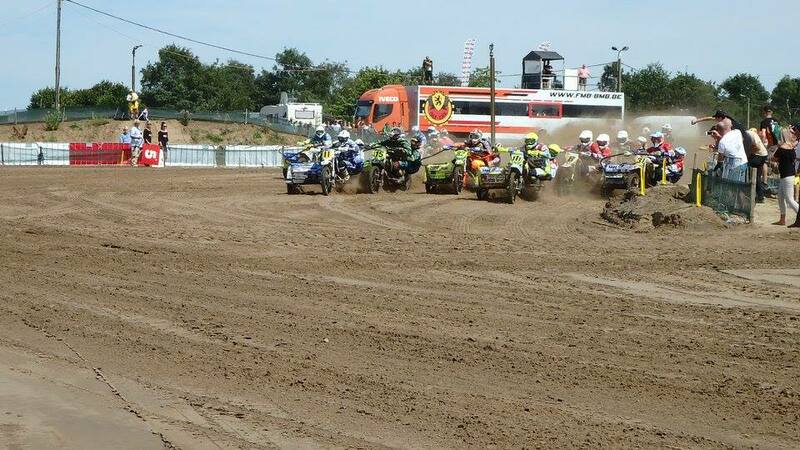 This weekend the last real sand track race of the GP season took place in Netherland. Team Cermak had a good qualification and was on the 4th place at the start gate. But at both races they had a bad start - about top 10. 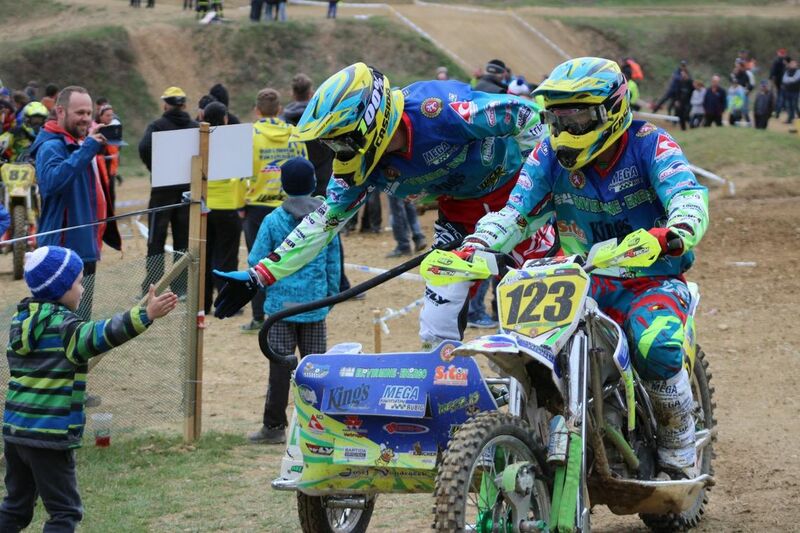 In the first race Team Giraud/Musset who was in front of them had a crash and Team Cermak lost 7 places. So they drove from the 17th position. At the end of this race they finished on 11th place. In the second race they drove from 13th position, after 3 laps on 11th position and due to good rhythm at top 10. 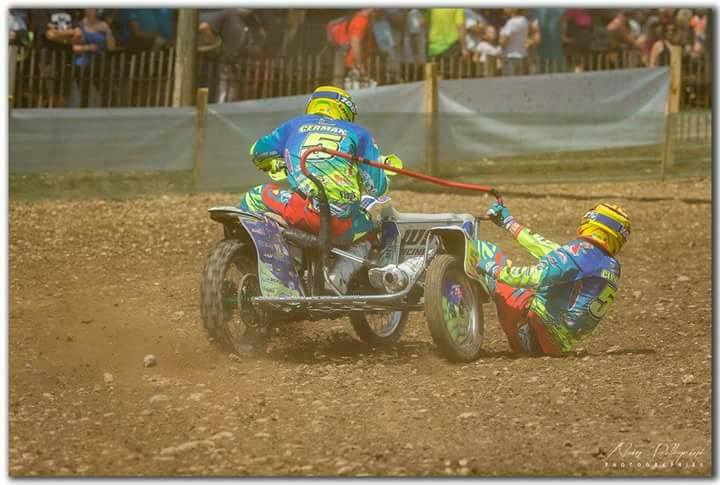 After a little crash they made a mistake - the front wheel was too deep at the sand line and they lost again 6 positions. Finally they finished on 12th position. In total GP champions result Team Cermak is on the 6th position together with Team Daniel Willemsen who have the same points. On this weekend the weather was a really bad. It was very rainy and therefore, the track turned quite muddy. In qualification team Cermak had a good start and drove behind Giraud/Musset. Due to a bad crash the qualification was stopped after 10 minutes. Therefore the result at this moment was the result for the start group A at the race. This means 3rd place for team Cermak at both races on Sunday. After start of the first race team Cermak was on the 4th place. Before finish they had a little problem with the temperature of the engine. They lost one place and finished on the 5th position. At the second race Team Cermak had a good start again and they drove from the 3rd position. They could over take team Brown and then they followed team Vanluchene/Kur pieniks on 2nd position. But at the end of the first lap they made a mistake. After a hard brake the engine stopped. They lost the good position and they re-started from the 23rd positon. Finally they could finish the race on 10th position. 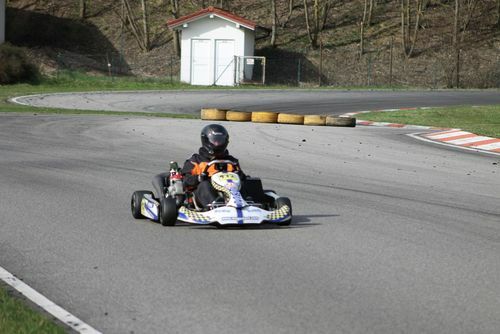 During qualifikation team Cermak had a perfect start and was able to hold the first position until the end of the race. In the first race they had a good start and after 4 laps they could take the lead. 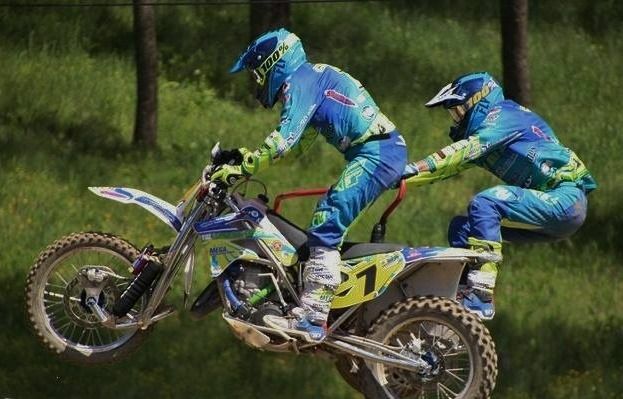 Then they held the position and finished on first place. Before the second race it rained cats and dogs. Unfortunately, the rain did continue during the race as well. After a few laps the track was covered with big holes and the run was more like an off-road. 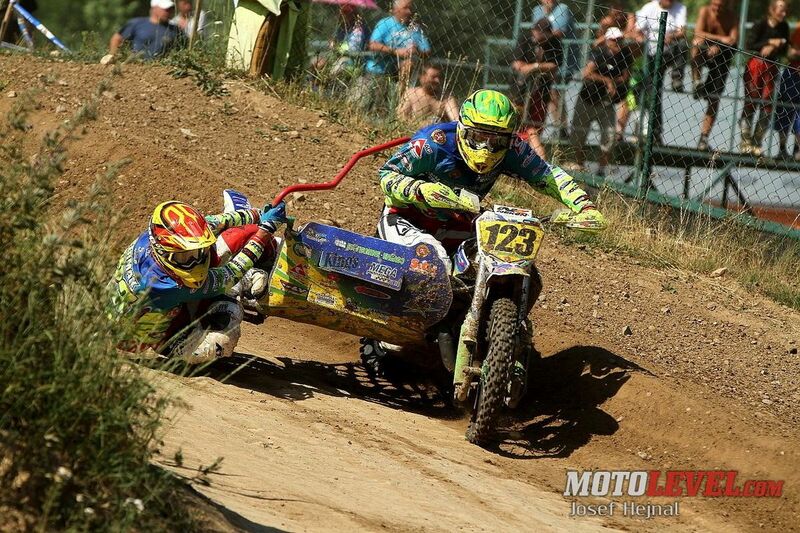 Team Cermak had to give up because of water getting in the carburetor and was therefore unable to finish this GP. 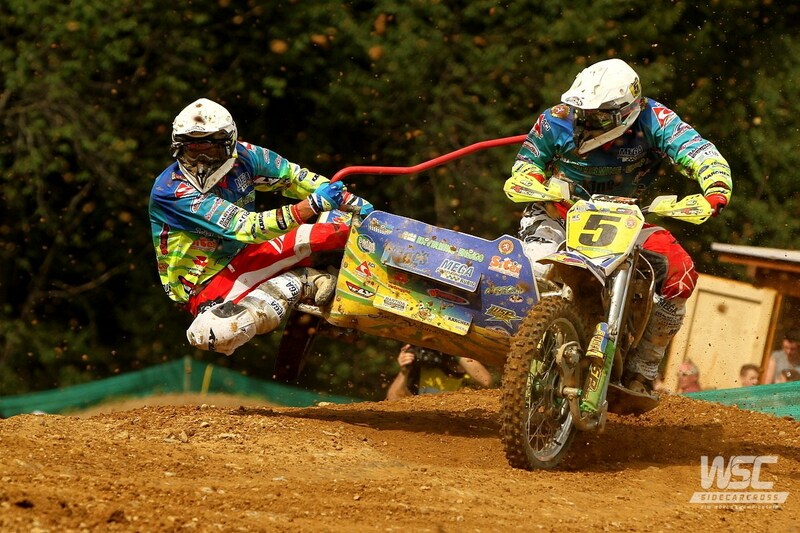 It was the 3rd race of Czech championship. Before starting this race Team Czermak was leading with 6 points ahead Team Cerny/Musil. The track in Horšovský Týn is very technical. Team Czermak made a good setting of the chain sprokets and could hold in qualification the first position from start until end. This was the best chance to take the best position on starting gate in both races. Unfortunately in first heat Team Czermak had not a good start. On the 4th position at the beginning they could move to the first position after 4 laps. The speed and due to the selected lines the team was faster then the competitors. In the second race the start was not good again. But after 4 laps they were on the 2nd place behind Team Cerny/Musil and at the end they could overtake them. Therefore Team Cermak could reach full total points from this race. At the moment they are leading the Czech championship with 12 points. Before this race team Cermak was on 9th position in the overall results. Due to the bad second race in Kramolin they lost some points. They already drove in Brou 3 times before this race. The Technik parametry track is not easy, but team Cermak likes technik tracks with lot of jumps and curves so Brou is what the team prefers. On Saturday the team had little problems with the right setting of the bike and at the qualification they were on 5th position. On Sunday they achieved 9th position for both starts. In the first race they overtook 2 teams and drove on the 7th position. In the second race again the start was not very good - only 10th position and at finish on 8th position. In total team Cermak finished this race on 7th position. For team Cermak this was a very important race on the home track. On Saturday they had a good time in at the pre-qualification practice. Second position on start line to qualification and at the finish 4th place. On Sunday they had a good starting Position (7th Position). In the first heat they had a good start and were on 5th place. Behind them, on 6th Position, were Brown/Chamberlain. They pushed from the first minute and after 6 laps they overtook team Cermak which finished this race on 6th place. In the second race, team Cermak had a bad start. They were on 9th place in the first race. Unfortunately in the 5th round they had technical problems due to a stone from the team in front of them which had gone in the system of the engine. They had to stop and lost time with starting the engine again and lost their 8th position. In total team Cermak finished on 11th place. Current position after 2 GP races 9th place. Team Cermak went into the deep Dutch sand to Oss. After a good qualifying result they were able to secure the 3rd place in the Qualy Race. This was a good basis for the first race. After a great start they could hold the speed in the leading group and finished the race in the 6th position. The start of the second race was brilliant again and the team was able to drive the first laps in second position. Once the conditions were more difficult to track they had the sand proven teams leave the front places and finished the second race in the 8th position. In the overall standings was the 7th place. 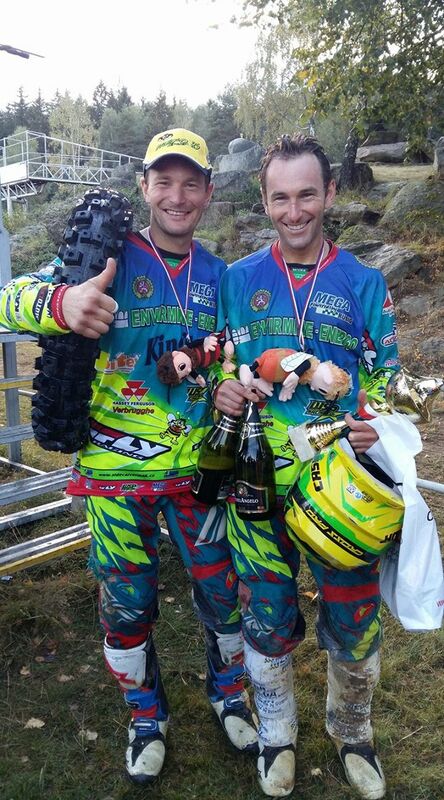 With this promising result it goes to Kramolin, where the Rübig MEGA Team will attend the race. 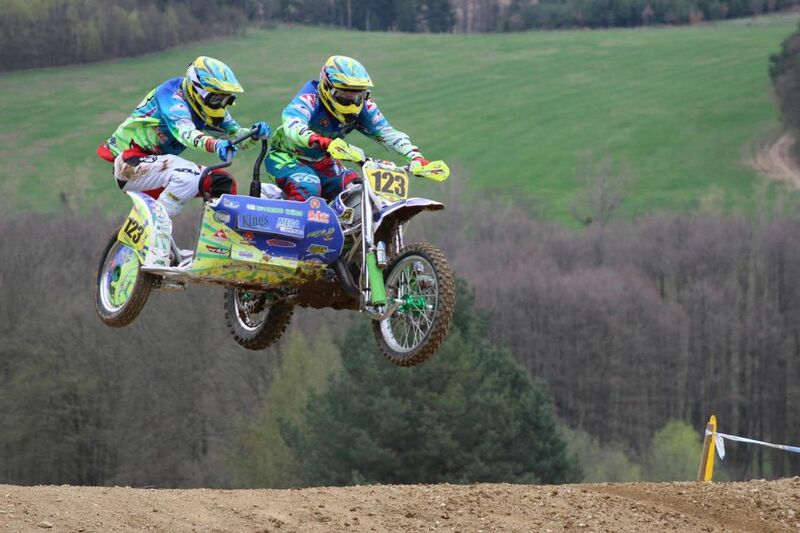 On Saturday 2nd of April the first race of the Czech Championship took place. 21 teams started, 9 teams with MEGA engines. 19 teams finished the race whereby 5 MEGA-teams are amongst the top 10. MEGA team Cermak was able to seize the overall victory as well as the first places in both runs. Team Gabor (http://www.sporttymdibla.cz ) - now MEGA-distributor in Eastern Europe –could seize the 7th place. 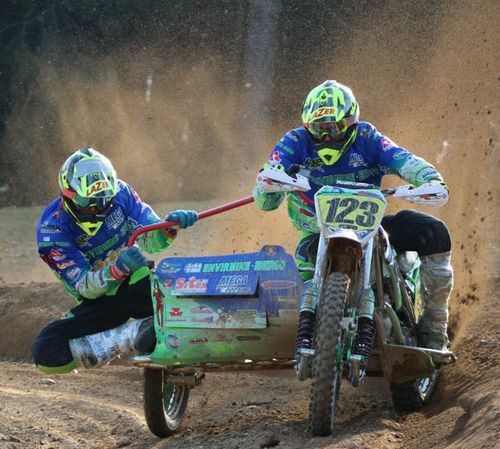 The next sidecar race, which belongs to the World Cup, will be held on Saturday 9th of April in Oss / NL.